Baznbridge Town keeper Tuda Murphy is set to miss the rest of the season. 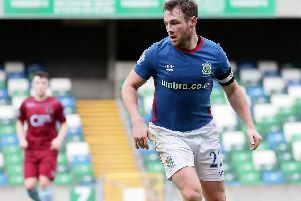 The former Cayman Islands international suffered a head injury in the 3-1 defeat to Dundela in January. That coincided with Town’s dip in form but the stopper was expected to return in a matter of weeks. Boss Ronnie Haughey now says it seems that Murphy’s season could be over and the manager backed stand-in keeper Andrew Cullen to fill the void. “The signs are that Tuda’s recovery is going to take longer than we had thought and Andrew could well be in there for the rest of the season,” he said. “Of course, a fit Tuda Murphy is an asset to Banbridge Town, as he would be to any team in our division. We’ve seen that with the run of form the club had when he came in. “However, if Andrew continues to acquit himself the way he did on Saturday then there will be no fears whatsoever. Town travel to Moyola Park on Saturday (kick-off 3pm) knowing a win would go a long way to securing a top-half finish. And young forward Stephen McCavitt, who has come up through the ranks at the club and scored in Saturday’s 1-1 draw at Bangor, looks set to hold his place in the line-up. “Stephen was a big positive for us from the weekend,” continued Haughey. “He has bags of potential. He scares defenders with his pace and he’s a big, strong guy. He has started to bloom all of a sudden and hasn’t been phased by anything. He just needs to add goals to his game and he did that on Saturday. “It helped to have everybody, bar Tuda, back to fitness again. They were all bursting to get a result. We always looked capable of getting at Bangor, which we did, and if we had come away with all three points, I don’t think Bangor could have complained. Kevin Anderson returned after illness to start in Town’s midfield on Saturday, another huge boost according to Haughey.